When designing desktop apps, websites, and mobile applications, more than once I have tried using an application like mockingbird or Pencil Project. On one hand, mockingbird, is a web application that can be accessed from any browser and allows you to design multiple pages with different elements. On the other hand, Pencil Project, initially born as a Firefox extension, now has a multiplatform desktop application that allows you to mockup easily. Anyway, the other day I discovered Wireframe.cc, and the truth is that I was quite impressed by the UI. It is super-easy and fast to use. You just drag the mouse while clicking and voila, you have an item of the size of your selection. You click on the type of item you want and you are done with the item. Even if you want to change attributes, you just have to double click on it, and select the attributes you want to change. Actually, it is the first time I feel that I do not waste my time doing mockups with an application of this kind. From what I’ve seen, this application is starting, and it still lacks of some functionalities and needs some polishment, but I suppose that those will be added in the future. Even I think this lack of complexity and lack of tons of box types is what makes you go faster. 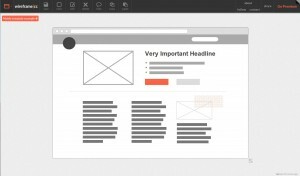 I think choosing the right tool for a job is a matter of personal preferences and personal needs, but I would recommend trying wireframe.cc and taking a look at the other apps I pointed out at the beginning of the post.